Posted on July 14, 2014 by Financial Underdog	in personal finance. I’m one of those weird people who actually track their family spending. That’s right, instead of just tossing money left and right like your average rap musician, I actually keep track of every dollar our family spends. Yes, every dollar. In fact, every cent. I use Mint.Com to keep track of every single cent that leaves our account, and I give every dollar a mission to accomplish – whether it is to feed us, pay our bills, or to work hard for us in a form of investment. Call me a financial nerd but tracking our expenses and spending our money on purpose have been the main factors behind paying off our debts and increasing our net worth towards financial freedom. 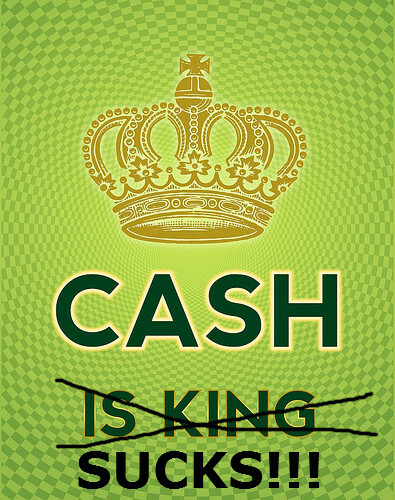 Now, you try tracking your spending with cash – it’s impossible and that’s why I hate cash. As soon as I get stuck with cash for whatever reason, I can never figure out where it went. You pay for your lunch with a crisp $20 bill, and get a handful of change in return – you don’t expect me to track my change, do you? What am I supposed to do, count the pennies? 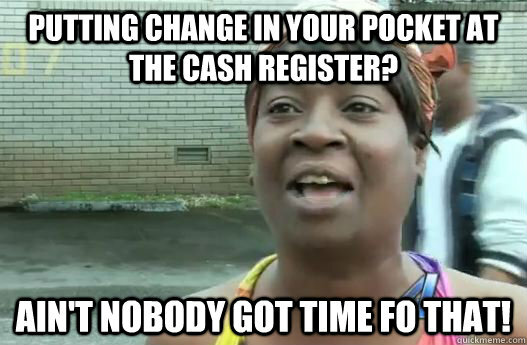 Ain’t nobody got time for that. The traditional financial wisdom says that everybody should use cash because it hurts to use cash, and spending plastic money doesn’t. Supposedly, you spend less with cash, but you spend like a drunken sailor with debit and credit cards buying puppies, iPods, and chewing gum. Let me be the first one (or millionth) to pop this fairy tale. Spending cash for me is absolutely painless, but I’ll think twice before pulling out my debit card. When I have a few $20 bills in my pocket, all of a sudden my pockets start to burn. Oh hey, I have money! I can spend it with impunity! It’s literally like having free money. It doesn’t register as money to me for some reason, and gets spent with Millennium Falcon speed (that means “fast” in case you’ve never seen Star Wars). Debit and credit charges on the other hand always hurt. They’ll show up in my bank transactions, they’ll be automatically reflected in my budget, and they’ll be the silent witnesses of my (sometimes sad) spending behavior. Heck, they’ll silently judge me for my spending. There’s no getting away from them, even if it’s just few dollars. Heck, my wife will know about them. “- Hey honey, I see Burger King in transactions, I thought you’ve decided not to go there anymore?” Crap! Well, I guess we found what cash is good for – cheating on your diet. What, like you’ve never lost money? Come on, it happens to everybody. You put it on the counter, and your cat pushes it off the table. The wind picks it up and blows it out of the window. You try to reach your house keys and it simply falls out of your pocket. Your couch swallows enormous amount of change only to be found when you replace your couch. Your dog eats your $20 bill because he thinks it’s your homework. You see a large guy chasing you while walking late at night, and you throw bills at him trying to convince him not to kill you. There are millions of ways you can lose your cash, and that’s why I hate cash. Try losing your plastic debit card. You just go and get a new one. No big deal. But what about The Big Brother? Seriously? You actually think The Big Brother is interested in how I spend my money? They’re investing in new tracking technologies, super computers, and electronic payment methods just so they can learn that I just spent $2.55 on ice cream at a gas station? I think the world elite has better things to do. Seriously, it’s nothing but annoyance. It’s hard to keep track of, it’s extremely easy to spend, even easier to lose, and overall it’s just inconvenient. Perhaps, the only good thing about cash is being able to sneak a greasy burger here and there without your wife knowing. Outside of this … I hate cash! PS: In case you just happen to be looking for an opportunity to unload large sums of money in cash to a friendly young man for no particular reason, please disregard information presented in this article completely. I’ll take it. Yours truly, Financial Underdog. Well, here’s a real world example. I actually tried the so-called “envelope system” and it just pissed me off to no end. You’re supposed to take the money out for food, rent, misc. expenses – whatever you’ve budgeted, right? You walk around with all the cash going from store to store, and everytime they give you change, it would just inconvenience me. Am I supposed to walk around with all the change now? Roll the dimes and quarters? Heck no! Change ends up in your car, on your counter, in your pockets, on your driveway – all the money just gets wasted. Pretty soon you try to get rid of it, but nobody wants it. You start buying things just for the sake of getting rid of all the change. Heck, you just give it to homeless people and girl scouts just to get rid of it. With plastic money – no such thing. Plastic is way more efficient. With plastic not a single cent gets wasted, everything adds up, and you don’t leave a small trail of plastic change everywhere you go. Everything is accounted for, even a single cent transaction gets assigned to a budget in Mint. Efficiency all the way! You know what, this is a great tip – I should take all the change I’ve collected over the years and just dump it into Superstore’s self serve check-out. This is a fantastic idea! From there I go to the grocery store. I go through the store and get everything on my list. To my surprise, the total on the cash register says $143.19. Crap, $18.19 cents over budget. Card gets swiped. I return home, $35.36 over budget. Now, had I had $175 of cash in my pocket, I’d be forced to pay attention at the gas station as well as at the grocery store (using a calculator to add up the cost of my purchases) because if I go over, I have no way to pay for the overage. none. The cash in my pocket is all I have. Yes, it all comes down to self-discipline, as you could force yourself to stay within the confines of your budget even by using a debit or credit card. But lack of self-discipline is what got me $109,000 in credit card debt. whoops, my math doesn’t add up…but you get my drift. I absolutely see your point. I guess we do things a bit different as we budget monthly figures – so as long as the total for the month falls within the limits, I’m a happy camper. For example, our monthly food budget is $600. So, if one week we spend $90, the other $140, and so on – I don’t sweat the variation. BUT! If we’re at the end of the month and all of a sudden I see we’re at the end of money, say there’s only $40 left in the food budget, we just do essentials to make sure to we fall within our budget. And if we have nothing left, we scramble for left overs, open up our pantry and see what’s left and what can do to last till next month. “- Hey honey, we have 5 days till new month, but have no money left. What can make out of noodles, eggs, and pine cones to last us till then?” 🙂 And sometimes it means sacrificing somewhere else, for example I’d say “Let’s go shopping for essentials, and we’ll put it into my blow money“. As long as totals are all within our budgets – I don’t sweat it. LOL, that’s hilarious…..I hope one day I can be trusted with Electronic money. 😉 We’re venturing into trying to use a credit card responsibly…so we’re trying. But it’s making me VERY uncomfortable! Great post though, I enjoyed reading your perspective! money in the end is just another form of powerfew politicians want to do what's best for the country, particularly once the system has been sufficiently corruptedin israel, certainly there's an elite that has been financially compromised. The EU and Soros have funded numerous orgs in Israel. And there's the knowledge that if you want to work internationally, particularly in the media, you have to take left wing posdtions.Consiiering how cheaply Olmert sold himself, and the Dov Weinglass casino stuff, all these are major issues. Every. Single. Word of this!!! I use a budgeting program called YNAB. It’s like the envelope system, but virtual. So instead of assigning physical cash to an envelope, you assign the money that’s in your bank account (ie, “cash”) to categories (ie “envelopes”). We’re heavy credit card users, and so if I have $200 in in the grocery account, and I buy $100 worth of groceries and I enter the transaction, then it takes the $100 from that category and automatically moves it to the credit card category, just waiting there to be “spent” (ie, pay the credit card in full when the bill comes in). Ingenious! My husband also doesn’t want to keep cash on him. He wants to spend it. But he finds that having the credit card helps because he knows that I’ll know if he spends on take-out. Haha. And he keeps the debit card at home because he says he is too tempted to do cashback at a gas station or something and use it to sneak buying stuff. And I hate how random money goes missing too!!! Ughhh!! Thanks for informing me, I didn’t know such thing exists. Will do more research on it!